"This galette is very easy to make. It is very rustic looking and very delicious. Perfect for company. Pluots are a cross between a plum and an apricot. Try different fruits; any of them will work." Combine flour, 2 tablespoons sugar, and salt in a food processor; pulse until blended. Add butter; pulse until butter is the size of peas. Pour in water and pulse until dough comes together. Shape dough into a disc; wrap with plastic wrap. Chill until firm, about 30 minutes. Cut pluots into thin slices using a mandoline slicer. Place pluot slices, 1/3 cup sugar, cornstarch, and lime juice in a bowl; toss to combine. Preheat oven to 425 degrees F (220 degrees C). Line a baking sheet with parchment paper. Roll dough out into a 12-inch circle on a floured work surface. Transfer to the baking sheet. 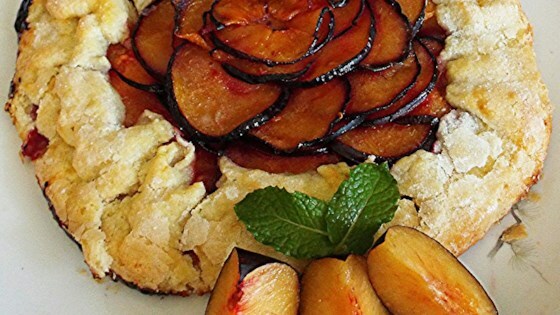 Arrange pluot slices in concentric circles over the dough, leaving a 1-inch border. Fold the border up over the pluot slices, pleating to hold slices in. Brush beaten egg over the border. Bake in the preheated oven until dough is golden brown, about 45 minutes. Let stand for 10 minutes before slicing. See how to make a quick-and-easy, award-winning key lime pie.